Seaweed Assault puts the player in command of the Manatee, a semi-organic submarine from an advanced underwater civilisation (can you imagine how mental the box art for this game would have been if it was an official release back in the 80s?) tasked with stopping wild seaweed strangling the civilisation to extinction. 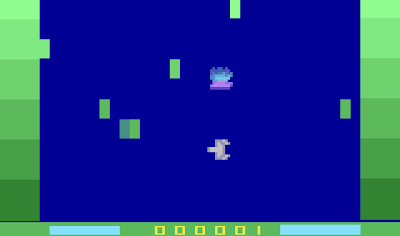 The game does the best it can with the limited graphics abilities of the VCS and the Manatee itself is a relatively complex animated sprite, undulating its fins like a stingray. It flashes different bioluminescent colours when taking, or repairing, damage. A degree of underwater physics is also thrown in, with the Manatee subtly drifting after moving, one of the nice touches that adds to the game's playability. So, the Manatee begins its quest to decimate the quickly regenerating seaweed, while mature seaweed tentacles occasionally strike out, snake-like, shooting up to the top of the screen, with potentially deadly results for the little submarine. Sometimes destroying a clump of seaweed reveals a corroded homing health canister that will try to repair your submarine by docking with it. These damaged canisters, trapped and rotting inside patches of seaweed, have lost their ability to repair the ship and instead crash into it, with potentially disastrous consequences. The only way to defeat them (they can't be torpedoed) is to try and trick them into hitting another lump of seaweed as they chase the sub. I found this particularly exciting because I'm still dining out on this one time seven years ago playing TIE Fighter when I made two pursuing X-Wings crash into a freighter, but I digress. "Corroded Homing Health Canisters make a sound while trying to activate which confuses mature seaweed tentacles and makes it harder for them to sniff out your 'scent', so they will hesitate before going after you." So you see, mentioning a hidden depth wasn't just a crap submarine joke after all. There's a lot going on under Seaweed Assault's bonnet. Wrothopods, for instance. It would have been easy (easier, anyway) for designer Duane Alan 'Random Terrain' Hahn to have added these big cephalopods simply as a cameo baddie to turn up, try and sink the Manatee, and get torpedoed in the face. But instead the Wrothopod is a protected species, and any hits inflicted on the big guy are fed back, damaging the Manatee. And shooting it gets it mightily upset too. 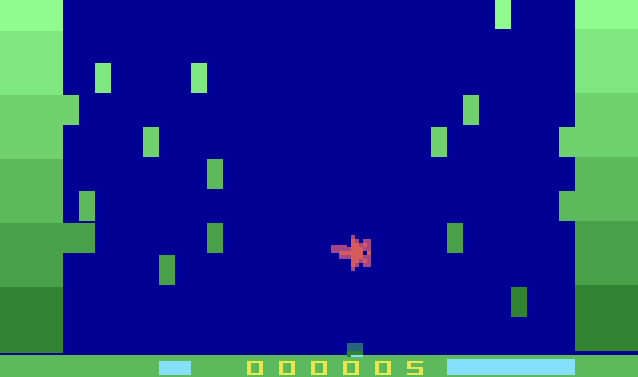 It's a surprisingly challenging game at first, with a bit of difficulty in lining up shots, but like many Atari 2600 games before it Seaweed Assault is an exciting and enjoyable pick-up game, doing exactly the sterling work the VCS was designed for. Smart gameplay sits alongside with well executed graphical touches, and the level of thought that has been put into the game, which drew advice from the forum users of Atari Age through its production, can be summed up by the fact that it even has an option for left handed control! 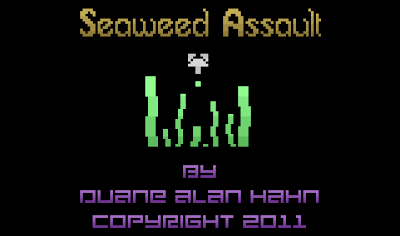 Download the game here (from the Seaweed Assault website). 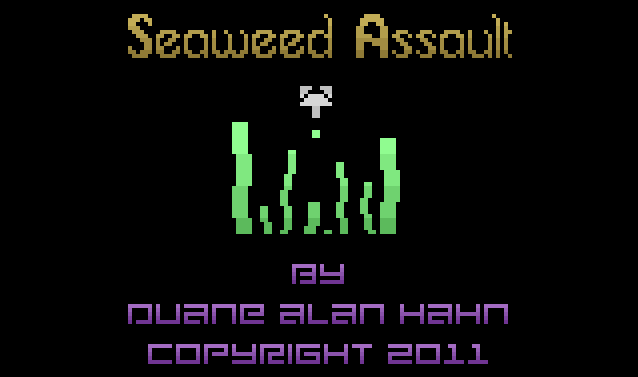 (Note that Seaweed Assault also runs on an Atari 2600 or 7800 using the Harmony Cartridge).